Discover this green haven in the centre of London. 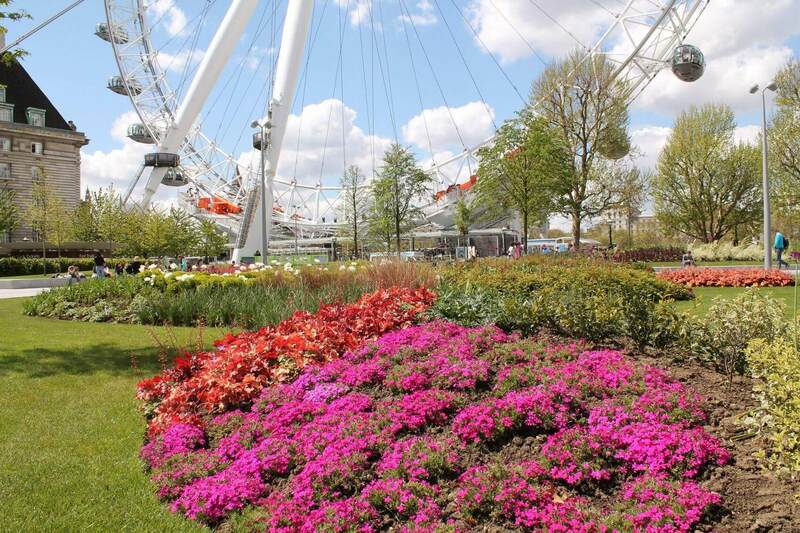 Located at the foot of the majestic Coca-Cola London Eye, Jubilee Gardens is a landscaped park where visitors can relax and take in the riverside views. Jubilee Gardens underwent a transformation in 2012 to turn it into a soft, green and sustainable park with new flower beds, granite pathways and seating edges, 97 trees and a brand new contemporary playground. The outdoor space is located within easy walking distance from several London Underground stations: Waterloo, Embankment, Charing Cross, Blackfriars and Westminster. Playground - the adventure playground is located within the park and is suitable for children aged 3 - 11. Jubilee Gardens is accessible from both the Riveriside Walkway and Belvedere Road. When these temporary buildings were dismantled the site became a car park. It remained so until 1977 when a park was laid out for the Queen’s Silver Jubilee. The gardens underwent a transformation in 2012 to celebrate HRH Queen Elizabeth's Golden Jubilee - the Queen subsequently reopened the gardens in October that year. Within the park you can find a large adventure playground for children up to 11 years old - the playground is open until dusk every day. Jubilee Garden's neighbours include an ogre and several sharks as SEA LIFE London Aquarium and Shrek's Adventure! London are located next door in County Hall. For all information on regulations and Jubille Gardens related news, please visit Jubilee Gardens Trust.